Are you using disposable diapers for your baby? Do you like the idea of using all-natural and organic products while living the green lifestyle? Would you like to save money on your baby’s diapers? If so, then you may want to consider switching to cloth baby diapers. Millions of disposable diapers are sitting in landfills today and thousands more will be added to that number daily. Disposable diapers don’t break down. Instead, they just sit there filling up landfills and creating a real ecological mess for the future. Therefore, while disposable diapers are more convenient in the sense that you use them, you throw them away, you’re done, they are also detrimental to the environment because they do not break down very quickly. In fact, you can save up to $1,700 a year just by switching from disposable diapers to cloth baby diapers. That’s right, using disposable diapers can cost you a whopping $3,000 a year! Plus, cloth baby diapers help the environment because they are 100% reusable! If you ask me, those are 2 great incentives to use them. While it is a little messy to deal with cloth diapers at times, there are a few simple things you can do to clean cloth diapers. 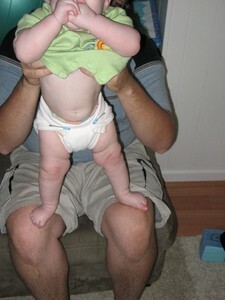 Today, cloth baby diapers come in several different varieties. Some are just like the cloth baby diapers you may remember from days gone by. Others eliminate the need for diaper pins and folded edges with different types of closures that keep snugly on your baby. While it costs around $140 to get set up to use cloth baby diapers, it’s well worth it. If you continue to use disposable diapers you will be spending about $3,000 a year. However, if you switch to cloth baby diapers, your total cost per year is between $400 and $1,300 — which is a significant savings. But what about the mess associated with cleaning cloth baby diapers? You really only need to wash cloth baby diapers every 2 or 3 days. You keep dirty diapers in the trash can with the lid on. Diapers just soiled with urine can go right in the can, poopy diapers need to be cleaned. There are sprays you can to clean them off, or you can just rinse them out in the toilet — then they too go in the can. When you’re ready to wash your baby’s cloth diapers, you put them in the washing machine and just run one rinse cycle. Then, you fill the washing machine and soak the diapers in the water and Biz (or another clothes soap). You should soak cloth baby diapers overnight (or all day) before running the washing cycle. This will ensure that all the stains get out. The diapers can then be dried and they are ready for use again. Along with the cloth diapers, diaper covers are also available. These are made from the same material as the rubber baby pants that moms used to use over cloth baby diapers. These can be washed in the washing machine. Then, you just lay them out to dry. Here are even more reasons to consider cloth baby diapers! 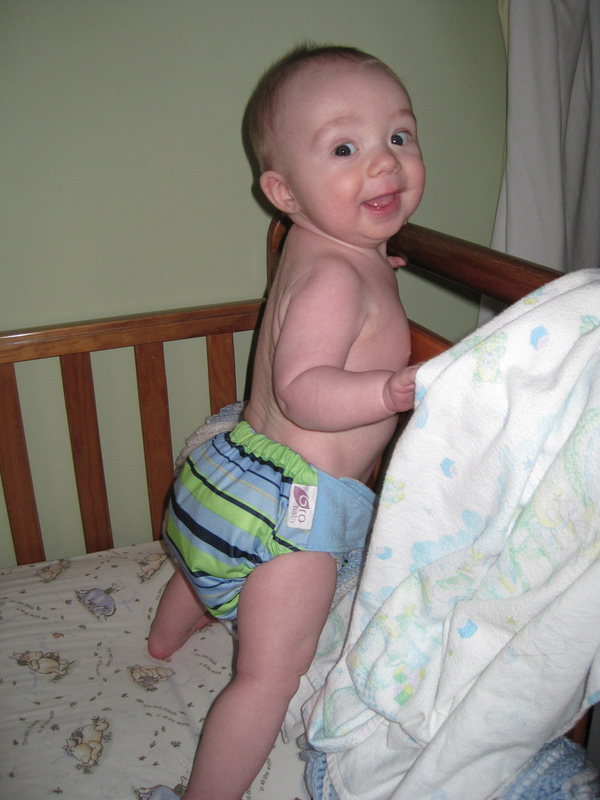 Read Cloth Diapers vs Disposable Diapers and Cloth Diaper Reviews.